Polyester fiber has become the fiber of choice within the textile industry, because of its physical properties, price, recyclability, and versatility, which offer a unique set of advantages unmatched by any other fiber. Since 1990, consumption of polyester fibers has grown at a sustained rate of nearly 7% per year globally. The polyester fiber market has grown to such an extent that it represents half of the total global fiber market (man-made and natural fibers). 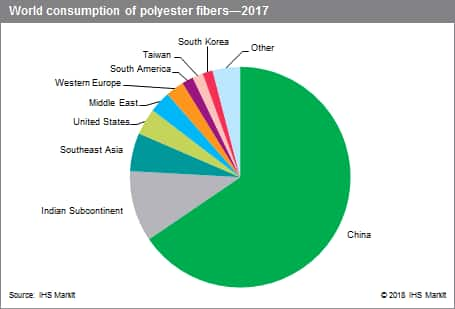 In 2017, total consumption of polyester fibers was dominated by polyester yarn, which accounts for about 69% of overall consumption (with textile filaments having the greatest share of the yarn segment). The major application for polyester fibers is the production of fabrics, which are further used for the manufacture of apparel, garments, and other finished textile goods. In 2017, the manufacture of apparel accounted for about half of the polyester fiber end uses. Home furnishings constitute the second-largest end-use sector, accounting for about 25% of the total globally. Most of the demand is now in Asia (China, India, and Southeast Asia), where the fast-growing textile industry has been consuming increasing amounts of polyester fibers in a chain of textile weaving, dyeing, and apparelmaking industries. Polyester fiber is the single-largest-volume fiber used globally, accounting for about 50% of the overall man-made and natural fiber market. Since 2000, consumption of polyester fibers has grown at a sustained average rate of almost 6% per year globally, because of their low cost of production, as well as versatility and relatively large spectrum of applications (from heavy-duty industrial applications to consumer apparel and home furnishing products). Substitution of other materials has allowed polyester fiber to grow faster than the fiber market itself. The main competing fiber for polyester is cotton; as a result, the supply and demand balance within the cotton industry affects the polyester fiber industry. In 2010 and early 2011 for instance, peak cotton prices resulting from global supply shortages and low stock levels boosted demand for polyester fibers. Conversely, after 2011, China built up large cotton inventories and cotton prices declined, having a limiting effect on polyester fiber demand. However, China recently decided to gradually draw down its cotton inventory, which is forecast to have a positive impact on polyester fiber markets globally. Barriers to entry are relatively low in the polyester fiber industry, and the producer landscape is therefore extremely fragmented. China alone has more than 900 producing units; the 15 largest global producers accounted for only about 30% of the global capacity in 2017. The majority of polyester fiber producers are back-integrated into PET polymer production and therefore run a continuous polymerization line upstream. Over the years, production of polyester fiber has migrated to Asia, which now accounts for 94% of global capacity. Most polyester fiber consumption has also now migrated to Asia, where the fast-growing textile industry has been consuming increasing amounts of product. China is by far the largest consumer of polyester fibers, and exports large amounts of finished goods, including apparel, curtains, and bedding, around the world. Northeast Asia is expected to remain the major actor on the global polyester fiber stage through 2022, accounting for nearly 80% of the new capacity and 75% of the demand growth. Nevertheless, as Chinese wages are gradually increasing, a gradual shift of textile production toward other less-developed but developing Asian nations (Vietnam or Bangladesh) is expected in the longer run, which will partially limit polyester fiber demand growth in China. The Indian Subcontinent will retain its position as the second-largest producing region, and Southeast Asia, capitalizing on its still-low labor costs, will pursue growth in the market and remain the third-largest producer globally. Outside of Asia, polyester fiber production and consumption will remain extremely limited. Developing regions will still ultimately account for the majority of the incremental textile requirements, but the slower pace of economic growth anticipated for these countries—China particularly—will nevertheless limit polyester fiber consumption growth compared with the past decade. In addition, a slower demand growth rate is now believed to be the “new normal” for the polyester fiber industry as markets gradually mature everywhere. In parts of the world such as Western Europe or North America, textile producers have been forced to restructure their businesses because of the large volumes of low-cost fabrics and clothing entering their markets and their inability to be competitive. As a result, textile capacity rationalization or transformation has been the watchword for the past two decades. The Western European and North American share of polyester fiber consumption has declined and accounted for only 7–8% of global demand in 2017. Over the next five years, the market for polyester fibers is expected to grow at an average rate of about 4% per year, broadly aligned with the GDP growth forecast for the emerging world. Current trends in energy, labor costs, freight, and raw material costs, are expected to further advantage polyester fibers over other fibers, further driving demand. In the short term, though, current lower cotton prices may somehow limit polyester fiber demand growth in applications where these products are interchangeable. Asia will remain the focal point of this growth as it will remain the manufacturing center for textiles, clothing, and apparel globally. In all other regions, the polyester fiber market will continue to grow slowly, in the range of 1–3% per year on average, particularly in segments that are less affected by inexpensive imports from Asia, such as tire cord or nonwoven fabrics. Textile filaments will remain the fastest growing product because of the increasing textile requirements in the emerging world.